The Milwaukee Brewers today announced that former Milwaukee Braves first baseman, the late Joe Adcock, will be honored as the newest member of the Miller Park Walk of Fame in 2016. A total of 34 votes were cast through media and panel voting, with Adcock receiving 23 votes (67.6%), exceeding the threshold of 65% needed for election. Adcock fell just one vote shy of election last year. Adcock spent 17 seasons in the Major Leagues, including 10 with the Braves. His tenure in Milwaukee spanned from 1953 to 1962, as he batted .285 with 239 HR and 760 RBI in 1207 games. Adcock notched a number of memorable feats while playing for the Braves. On April 14, 1953, he recorded the first base hit and scored the first run in County Stadium history. The following year, on July 31, 1954, he belted four home runs with a double at Brooklyn’s Ebbets Field, setting a single-game record of 18 total bases, which lasted 48 years. 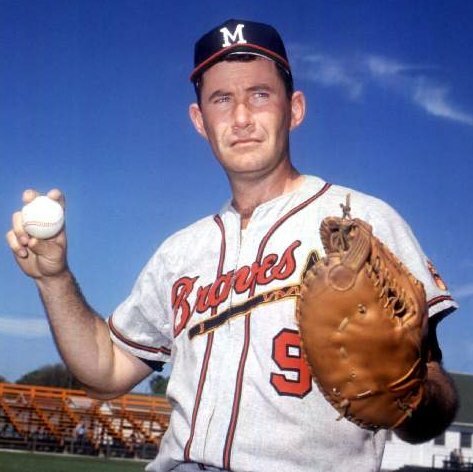 Adcock was also a member of the Braves 1957 World Championship team. He drove in the lone run in a 1-0 Game 5 World Series win vs. the New York Yankees. The Braves went on to defeat the Yankees, four games to three. On May 26, 1959, Adcock broke up Harvey Haddix’s 12-inning no-hitter with a walk-off double at County Stadium. Adcock ranks third in Milwaukee Braves history in hits (1206), home runs, RBI and total bases (2164). The induction of Adcock, who passed away in 1999, will take place prior to a game at Miller Park this summer, with the specific date to be determined later. Family members including his widow, Joan, are expected to participate. There were a total of 23 Brewers players and seven Braves players on the ballot. The ballot included on-field personnel who wore a Brewers or Braves uniform for a minimum of three seasons but have been retired from playing/managing roles for at least three seasons. All players and managers receiving votes on at least 5% of the ballots will remain eligible in 2017. Past inductees include Hank Aaron, Rollie Fingers, Paul Molitor, Robin Yount in 2001; Commissioner Bud Selig and Cecil Cooper in 2002; Bob Uecker and Harry Dalton in 2003; Jim Gantner and Gorman Thomas in 2004; Don Money and Harvey Kuenn in 2005; Eddie Mathews, Warren Spahn and John Quinn in 2007 (the first year that former Braves players appeared on the ballot); Lew Burdette in 2010, Johnny Logan in 2013, and Teddy Higuera in 2015. Helena Brewers President & General Manager, Paul Fetz, was named Pioneer League Executive of the Year during the Fall Meetings in Missoula. This past season was Fetz’s 27th in professional baseball and 13th as GM of the Helena Brewers. This was the second time Fetz has been named the Executive of the Year and will receive the award in Nashville at the Baseball Winter Meetings in early December. The Brewers rebranded their image through a new mascot and increased community involvement through the Reading Program and participation in community events. As a result, regular season attendance increased almost 10% over 2014 despite air quality issues from smoke and some rainy weather. 2015 regular season attendance even outperformed the 2013 regular season which was a playoff year. Fetz came to Helena when professional baseball returned to the city in 2003. 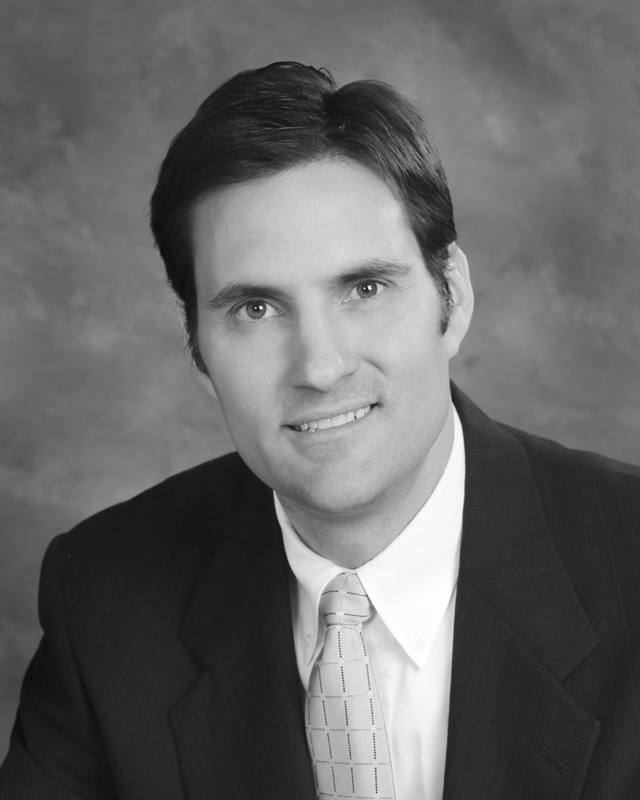 In 2008, he was helpful in the negotiation of the current long term 20 year lease. In 2014, the club signed a 4 year Player Development Contract extension with the Milwaukee Brewers. “Paul has been a contributing member of the Brewer family for years and a solid participant in the Helena community. His passion for the game shows up every day. He is well deserving for this award,” said Special Assistant to the GM/Director of Player Development for the Milwaukee Brewers, Reid Nichols. Minor League Baseball and Rawlings Sporting Goods Company, Inc. today announced Minor League Baseball’s recipients of the 2015 Rawlings Gold Glove Award® for defensive excellence. Brewers prospect Orlando Arcia was awarded the Gold Glove at shortstop after an impressive all-around season at the plate and in the field, including just 13 errors in 585 total chances (.978 fielding percentage) for the Biloxi Shuckers (AA). This is the second consecutive season that a Brewers prospect has won the award, as outfielder Michael Ratterree received the Gold Glove with the Wisconsin Timber Rattlers (A) last year. Arcia was named the organization’s Player of the year earlier this month and is widely regarded as one of baseball’s top prospects. He finished his first season at the Double-A level batting .307/.347/.453 with 37 doubles, seven triples, eight homers, 69 RBI and 25 stolen bases in 129 games. The 21-year-old finished his campaign among the league-leaders in several categories including average (5th), at-bats (2nd, 512), RBI (4th), doubles (1st), slugging percentage (5th), extra-base hits (3rd, 52), runs (5th, 74) and total bases (2nd, 232). He set new career-highs in almost every hitting category including runs, hits, doubles, triples and home runs. The Venezuelan native was signed by the Brewers as a non-drafted free agent in 2010. He was named both a mid-season and postseason Southern League All-Star this year. Arcia was honored with the League’s Player of the Week award for May 25-June 1 when he batted .400 (10-25) with 6 runs, 5 doubles, a homer, 5 RBI and 2 walks in six games. In addition, Arcia was selected to represent the World Team in the 2015 Futures Game at Great American Ballpark in Cincinnati. Arcia is ranked as the top prospect in the Brewers organization, according to MLB.com. Arcia will receive his Rawlings Gold Glove Award, molded after the iconic award given to Major League Baseball’s top defensive players, during the 2016 season. 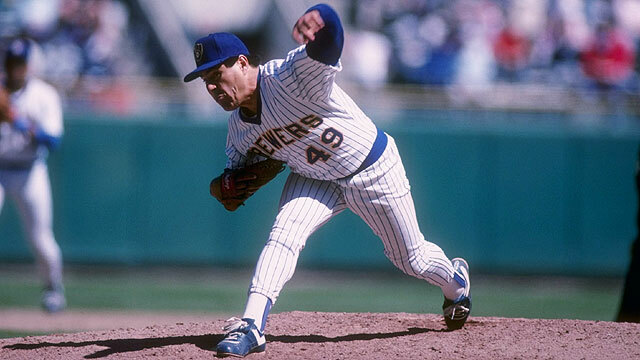 The Milwaukee Brewers today announced that pitcher Teddy Higuera will be honored this season as he has been voted as the newest member of the Miller Park Walk of Fame. A total of 32 votes were cast and Higuera received 25 votes (78.1%), exceeding the threshold of 65% needed for election. Higuera fell just two votes shy of election last year. A lifetime Brewer, Higuera played nine seasons with the team. He started his career in 1985 and went 15-8 with a 3.90 ERA with 127 strikeouts, while finishing as the American League runner-up for Rookie of the Year. The following season, Higuera posted a 20 win season, going 20-11 with a 2.79 ERA, with 207 strikeouts and 17 complete games. He earned All-Star honors and finished second on the Cy Young Award ballot. Higuera followed his success by setting the franchise record for strikeouts in a season with 240 in 1987, as he went 18-10 with a 3.85 ERA. He went 94-64 with 3.61 ERA in his career, and currently ranks third among franchise leaders in career wins and strikeouts (1,081). Higuera will travel to Milwaukee and be recognized for the honor in a pre-game ceremony on Friday, August 14 as the Brewers face the Phillies at 7:10 pm. Joe Adcock (20 votes) and Mike Caldwell (17) were the closest to qualifying among eligible former players and coaches. There were a total of 29 Brewers players and seven Braves players on the ballot. The ballots included on-field personnel who wore a Brewers or Braves uniform for a minimum of three seasons but have been retired from playing/managing roles for at least three seasons. All players and managers receiving votes on at least 5% of the ballots will remain eligible in 2016. Past inductees include Hank Aaron, Rollie Fingers, Paul Molitor, Robin Yount in 2001; Commissioner Bud Selig and Cecil Cooper in 2002; Bob Uecker and Harry Dalton in 2003; Jim Gantner and Gorman Thomas in 2004; Don Money and Harvey Kuenn in 2005; Eddie Mathews, Warren Spahn and John Quinn in 2007 (the first year that former Braves players appeared on the ballot); Lew Burdette in 2010 and Johnny Logan in 2013. Each inductee is honored with a granite plaque that is placed into the terrace area walkway that surrounds Miller Park. The Milwaukee Brewers announced their postseason award winners today as voted by members of the Milwaukee Chapter of the Baseball Writers Association of America (BBWAA). A total of seven ballots were cast for each award, assigning five points for first place, three for second and one for third. Catcher Jonathan Lucroy earned Brewers Most Valuable Player with all seven first-place votes (35 points). Lucroy was followed by center fielder Carlos Gomez, who received all of the second-place votes (21 points). Also receiving consideration was pitcher Francisco Rodriguez (3 points), pitcher Wily Peralta (2 points), right fielder Ryan Braun (1 point) and third baseman Aramis Ramirez (1 point). Lucroy, a first-time All-Star selection this season, batted .301 with 13 HR and 69 RBI in 153 games. He led the team in games played (153), at-bats (585), batting average (.301), hits (176), extra-base hits (68), doubles (53), walks (66), on-base percentage (.373) and OPS (.837). With his franchise-record-tying 53 doubles, he became the first primary catcher to lead his league in that category. His 46 doubles as a catcher set a Major League record. Jonathan Lucroy (28 points) also earned the Good Guy Award for the second straight season. He received five first-place votes. The other first-place votes went to pitcher Kyle Lohse (13 points). A total of seven players received votes. Wily Peralta was voted Brewers Most Valuable Pitcher as he received six first-place votes (33 points). He was followed by Francisco Rodriguez (17 points). The other first-place vote went to Mike Fiers (5 points). Also receiving votes were Kyle Lohse (7 points), Will Smith (2 points) and Zach Duke (1 point). Peralta went 17-11 with a 3.53 ERA in 32 starts. He led the team in wins (17), innings pitched (198.2), quality starts (22) and strikeouts (154). His 17 wins tied for fifth in the National League. Peralta had a pair of career-high five-game winning streaks this season, coming from June 5-26 and July 13 to August 7. Pitcher Zach Duke (17 points) earned Brewers Top Newcomer ahead of Francisco Rodriguez (15 points). Duke received just one first-place vote, but was named on every ballot. Rodriguez received three first-place votes. The remaining first-place votes went to pitchers Matt Garza (14 points), Will Smith (9 points) and Jeremy Jeffress (6 points). Duke went 5-1 with a 2.45 ERA in 74 relief appearances. He recorded 74 strikeouts in just 58.2 innings pitched. Duke was the only non-roster pitcher to make the Opening Day roster. From April 12 to May 10, he made 14 consecutive scoreless appearances (13.1ip). From June 22 to July 30, he had 16 consecutive scoreless appearances (14.2ip). Zach Duke also earned Brewers Unsung Hero honors with four first-place votes (25 points). Also receiving first-place votes were pitchers Mike Fiers (17 points) and Will Smith (11 points) and second baseman Scooter Gennett (6 points). Also named on ballots were pitchers Jeremy Jeffress (3 points) and Yovani Gallardo (1 point).